This is what I brought home after a flea market visit in a really hot and stormy day. I had one of these antique brooches from a while ago. I have found another one for less than 50 cents and in a better shape, with the paint still intact. I think they look nice together. I also found this plastic mouse with rhinestones eyes (from the sixties, maybe?). Very cute and in a good shape. But my favorite find is this strange silver ring from the forties. The red and pink rhinestones are really sparkly and I enjoy watching its funny shape on my finger. These are the findings of today’s flea market visit. There were also other stuff there that I liked (a very nice metal toy sewing machine, in working condition, some antique photos, etc), but I am much more selective with what I bring home lately and I try to resist buying things that I already have or I don’t use often. So, I only bought a few very cheap things. A silver cicada charm (I don’t think it’s old, but it’s nice and detailed). Two funny carved rings (they are quite a big size, especially the snake, so they were not intended for kids). I think they are made from sea shells. A small tin from the fifties (my mother had the whole set as a kid and she still has one or two of the tins, but in a much worst condition). They were kitchen toys for storing different ingredients, such as flour or sugar. This one says “semolina”. And a bead necklace from the fifties or sixties. The string was really old, so it broke in my hand at the flea market. Fortunately, I managed to find most of the beads and I have re-stringed it at home. It has the perfect size for me to wear it as a bracelet. The beads have a texture and shine very similar to teeth. Kind of strange, but I like them. Lately, I went very rarely to the flea market, for different reasons: being sick, being busy, too tired, raining or snowing or being too cold, etc. But yesterday, my mother told me she bought a grab bag for approximately 1 Euro and maybe I would like to check it out. But I didn’t expect a home flea market :). Apparently, it was a huge grab bag and she spread everything out on her sofa. A really absurd and unexpected image :). She had even sprayed everything with disinfectant, so I could safely brows through the small objects. 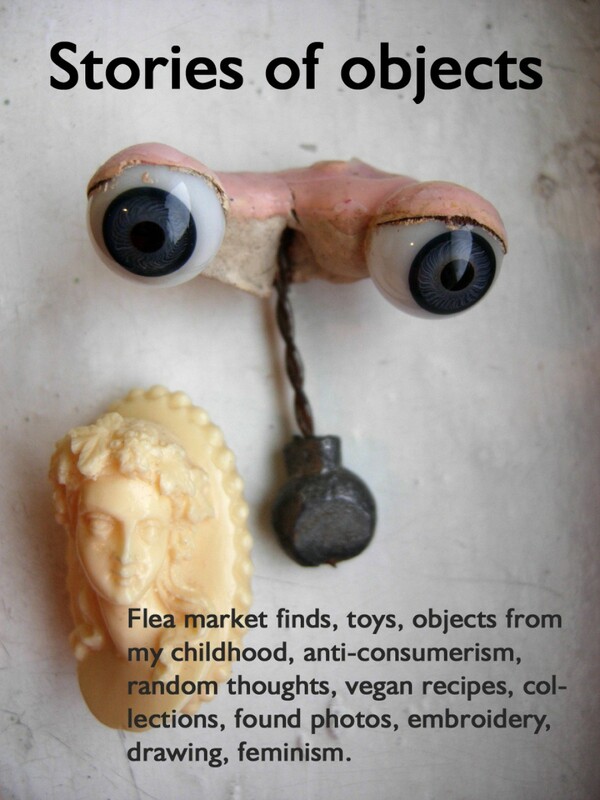 I didn’t have the patience to look through everything (there are mostly uninteresting things from the eighties and nineties, that my mother would sort before throwing out the mismatched plastic earrings and spoons and forks and even one old tv remote control). But I did find 3 interesting, older brooches, one very eighties plastic marbled backed mirror, a metal pencil sharpener and a small pocket knife. The pocket knife was a commercial to chocolate and seemed older to me. Searching it online, it seems it is from the twenties or thirties. Not in perfect shape, with the rust and all, but quite interesting.